BELFAIR — Twenty-two children arrived at a remote wooded camp this week with a secret they’re often afraid to tell others. A casual visitor wouldn’t notice. The children were laughing and smiling as they kayaked, swam and did normal kid stuff at Camp Lyle Mcleod, located by an isolated lake near Belfair State Park. He’s like most boys his age – except that he has a parent in prison. That was true for all the children, ages 8 to 12, who hung out with Cody this week, at the first summer camp ever held by the state Department of Corrections for the children of incarcerated parents. 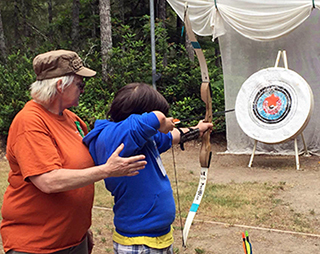 The department, in partnership with the Girl Scouts of Western Washington, hosted the Kids United By Incarceration, KUBI, camp from June 17–19 to provide a fun experience the kids might not otherwise have the opportunity enjoy. And to do so with peers facing the same struggles. She said a group of girls came up to her on Thursday and asked what KUBI, the logo stenciled on blue sweat shirts given to the children, meant. “I said ‘did you know every single child in here has a parent in prison?’ They were like ‘no,’ ” Giron said. DOC employees acted as counselors for the children, staying with them in yurts at the camp, helping them with activities and broaching the sometimes difficult conversations about having a parent in prison. Giron hopes the camp will also help dispel misconceptions the children may have about DOC employees. Giron came up with the idea of hosting a camp, solely for children who have parents in prison. She’s not aware of any other state with a similar program. Notices were posted at all 12 Washington state prisons, urging inmates to send in applications for their children. Inmates at 10 facilities sent in 89 applications, however many of the children were unable to attend for a variety of reasons, including illness and difficulty arranging transportation. In the end, 22 children arrived at the camp by bus at about noon on Wednesday. Funding for the camp comes from inmates and their families through the Offender Betterment Fund. No tax dollars were used. The projected cost of the camp, not including donations, is about $6,000. While this year’s KUBI camp was a pilot, it was so successful that DOC has already decided to hold another camp next summer, and the Girls Scouts have signed a contract to hold the camp yearly. Children interviewed at the camp all said they were enjoying the stay and hoped to return if the camp is held again. Cody on Thursday afternoon was hanging out with 9 year–olds Tucker and Roman by the lake. They were all laughing and sharing their experiences. “I like archery because they taught you how to shoot a real live bow at a target. And we never have before,” Cody said. Jody Becker–Green, who oversees DOC’s family services unit, said her biggest hope for the camp was to give kids a normal childhood experience. “If they go home and say that they had a good time, then I think for me that would be hitting the ball out of the park,” she said.